The Church of God is so much bigger than most of us can imagine. With nearly 900,000 believers around the world, attending nearly 8,000 churches in 89 different countries, the international reach of the Church of God is both broad and diverse. It can be hard to visualize the magnitude of that which God has allowed us to be a part, especially when our only consistent interface with the movement is from fifth pew back, piano side, once or twice a week. One of the best things about the Church of God Convention is the opportunity to see, hear, and participate in what God is doing outside our regular sphere of ministry. Church of God Convention 2017 will once again celebrate the international reach of our movement during worship gatherings and extra events. The commissioning of missionaries is always one of the most inspirational and poignant parts of the Church of God Convention. 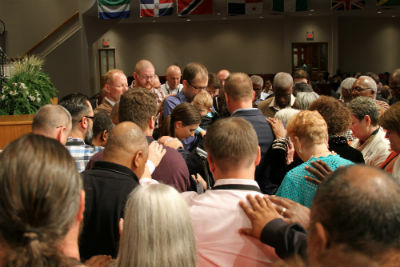 New missionaries are introduced to the movement, given time to testify to the work of God in their lives, and surrounded by brothers and sisters with outstretched hands in special prayer. 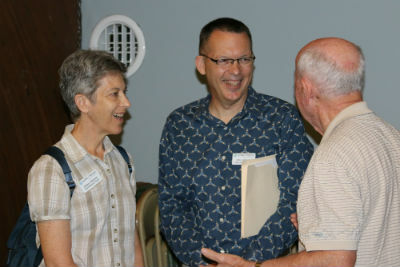 Photo: Mike Webb shares with friends at a 2016 missionary reception. This year, Global Strategy will commission the Stocksdales and Coppesses to Botswana, and Kaitlin Smith to Uganda. Each missionary unity has a unique story to tell and unique gifts to offer the communities which they will serve. You won’t want to miss this year’s commissioning of Church of God missionaries, scheduled to take place during the Thursday evening (June 22) session. 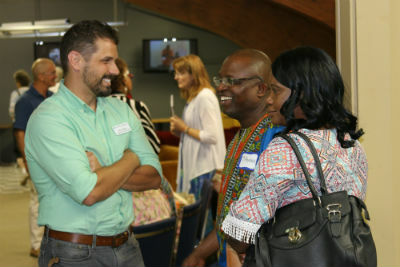 Photo: Gwen and John Johnson at a 2016 missionary reception. Following the Thursday evening session, Global Strategy will host a missionary meet-and-greet, complete with complimentary ice cream. Not your typical reception, this event will expand your perspective, and maybe even your world. More than twenty-five missionaries are expected to attend, and regional displays will make the experience informative and encouraging. Global Strategy is also expected to unveil their new, more interactive website at the event. The Church of God is also excited to celebrate the twenty-fifth year of our child-sponsorship ministry, Children of Promise. From 4:30 until 6:30 PM in the Activity Center at Central Community Church, Children of Promise will hold a twenty-fifth anniversary banquet. Special guest Jewel Leodones of the Philippines will share the impact Children of Promise has had on her life. Also attending will be Global Strategy missionaries Bobby Mishill, Corey and Abby Stocksdale, and Jon and Karen Lambert. Reservations are $25 and can be made through June 11 at http://www.echildrenofpromise.org/ourevents/25th-anniversary/. For more convention information and registration, visit www.chogconvention.org. Learn about Global Strategy at www.chogglobal.org. This entry was posted in All Church of God, Church of God Convention, Global Strategy and tagged Be Bold Reclaim, camp meeting, Campmeeting, Central Community Church, Children of Promise, CHOG Convention, Church of God Convention, Corey and Abby Stocksdale, events, Global Strategy, international, Kaitlin Smith, Kansas, KS, Missionaries, missions, NAC, North American Convention, receptions, Reclaim, Reclaim2017, Tim and Joy Coppess, Wichita. Bookmark the permalink.